And here we are, 365 days of counting and 52 drawings after. Tracking our days, our activities, our thoughts and behaviors and spending our weekends time crafting our data-gifts for each other marked the pace of our last year, and we’re now to a goodbye. The last topic of Dear Data has been our homage for the project’s end: a week of goodbyes, a week of all the things we left behind, a farewell to our laborious year-long effort. There have been different types of goodbye in my week, from the mundane greetings to friends, coworkers and salesmen to the actual acts of leaving things behind. This was the last week my boyfriend and I spent in the apartment we've been living for the last 2 years, and of course a big farewell goes to it and its memories. These kinds of goodbyes (and the closing salutation to one year of Dear Data) are the one that acknowledge the real passing of time, the ones that mark changes and the start of a new routine. Dear Data has been with no doubts one of the very best things that has happened to me in a while. I discovered new lenses to look at my days through, I learned about myself like I could never do before, I reflected about our data driven existence and my day job under new perspectives. And there’s more to that; this intense side project we carried on for a year made me realize more clearly than in my past what motivates me in my life. It led to me visualize my plans for my future as I haven’t been able to grasp before. But most of all over a year, I found a friend. Stefanie and I only 2 times before starting Dear Data, and this year-long data correspondence brought us incredibly close, it’s hard to remember that we don’t live in the same city, we’ve been present in each other’s lives as most of our “regular” friends haven’t. Over a year I’ve been able to compose a multifaceted ‘portrait’ of Stefanie through these 52 fragments of her nature: how she spends her days, what are the positive feelings and negative thoughts that occur to her, what are some aspects of her relationship with her husband, what are her desires and her fears. Each postcard has been a starting point to get to know a particular aspect of her, adding pieces to the puzzle, and serving as has the starting point to raise questions, even very personal questions we would ask each other after spending our time deciphering the received data gift. I admit I wasn’t 100% sure we could make it trough a year, but I am so glad we did. We both figured out how the collaborative aspect of the project was crucial for us to be able to stick to it: we’ve been holding each other accountable and pushing each other forward every week. The fact we weren’t “friends” in the beginning, but rather two people who respected the other for her body of work helped us being committed to the project, we didn’t want to let the other person down, we wanted to impress her. Moreover, by creating an outer expectation (the other person needs to receive the postcards and we agreed upon sticking to it for 52 weeks) we’ve been able to meet an inner expectation: personally - exploring different areas of my personalities and pursue a side and artistic project able to make me grow. It is not been easy at all, we are two strong-minded designers with different design sensibilities, and there has been many design battles along the way while building our website, shaping our public talks, and even recently working on our book. But what we have learned from each other has been (and is!) definitely worth it. Also the rigid format of the project (weekly data for 52 weeks) helped us staying focused: I realized how easier is it to concentrate on a single little aspect of your life every week - very rigidly - instead of investigating and exploring multiple ones at the same time as I always meant to do in my past (and with no results!). Personally, I am in various ways exploring the characteristics and the many aspects of human relationships, I am fascinated by everything around relationships between people, and around finding analogies and differences in the way we, as human beings, think, behave and take decisions. Professionally, I am very intrigued by the search for new aesthetics in data visualizations: novel engaging visual ways to convey the richness of the stories we experience in our everyday lives, rather than simplifications of the world. Dear data was the perfect excuse to combine and actually spend time doing what I love the most to do: drawing and reflecting upon human nature. Dear Data was always meant to be a personal challenge for us: we have been trying to extend ourselves in both our data collection and our drawing technique: nudging ourselves out of our comfort zones, and exploring and expanding on where one can find data and how it can be represented using new visual systems. Over this year Stefanie and I have been discussing multiple time how experimentations of this kinds, where we drastically limit the tools and the possibilities (like hand drawing with data), help us get back to the real meaning of data. Even when we work with ‘Big Data’ the whole point is making it meaningful, contextual, it’s all about making it smarter, and smaller, understandable. Data is more than numbers, it can represent real life, it can be a snapshot of the world in the same way that a picture catches small moments in time. Data can be emotional, data can link people, and even a relationship between two people can be mediated by data. Many people associate the “quantifiable” and “quantitative” with precision and objectiveness, and they are drawn to personal-tracking by the idea that this would solve some of their problems, and finding rational answers maybe. I think these kind of investigations aren’t really about finding definitive answers about ourselves, they are more about raising novel questions. When we think about data in our lives we always associate it with more efficiency, more automation, we argue we can absolutely use data to become more human, to connect with ourselves and others at a deeper level, if we design the right ways to do that. I want to take the chance of this last post to thank everyone who supported us on this year-long effort. Thanks to my friends for bearing with my un-polite data trackings that intruded in our conversations and for standing my alternate enthusiasm and despair for the project. Thanks to our agents Rebecca and Emma at Janklow&Nesbit for guiding our first steps in the world of publishers, and to our editor Helen at Penguin for inspiring us to work on our book in very un-common ways. Thanks to our dataviz friends, collaborators and Dear Data supporters who made our talks and podcasts interviews possible: Jer, Enrico, Moritz, Jon, Eric, Maral thank you! A big thank-you to my boyfriend Gabriele, for agreeing to be counted, tracked, mapped and revealed in my postcards, for feeling always joyful about the project, for engaging in Dear-Data conversations almost every day and for having been supportive, positive and never irritated by this year long interference with our life. And a big thanks to all of you for following us and for showing us your love for the project, it has been great beyond any expectations. And the biggest thank you to Stefanie, for bearing with my control-freak and organizational obsessive manners, with my design flaws and my English inconsistencies. But also thanks Stefanie form making me reconsider my idea of success: doing what you are passionate about and getting reward for it in the long term, feeling like you worked hard at the end of each day, being pleased in how you spent your time, but most of all creating a human connection that will help you raise your personal bar. _Hey! we’re not done yet! But stay tuned! Many more collaborations and explorations about data, drawings and humanity will happen, we promise! In the meantime, if you miss us you can watch our keynote talk at Eyeo, and listen to us on Data Stories and on the Policiviz Podcast! _p.s. and a shameful revelation. Of course we decided the last week of Dear Data was about “goodbyes” to include a special goodbye to Dear Data in our postcard. Guess what I forgot to add? As I am still without a phone this week, I have to find another way to gather data so Giorgia and I have decided that for old time’s sake we would go back to gathering all of our data in the small notebook that we used for the first week and then quickly abandoned when we realised it was more trouble than it was worth. While carefully noting down my goodbyes this week, I noticed that there are different ‘intensities’ of goodbyes, ranging from courteous goodbyes that you give to a cashier that you will likely never see again, to the ‘until we meet again’ goodbyes you say to friends, either sober or drunken (as many of my goodbyes were this week, since I said goodbye to lots of friends at the end of a bi-annual Brixton pub crawl my old studiomate and I held on Saturday that took in TEN pubs in an afternoon. I’m just including this here because I’m pretty proud of our achievement). Then, there were ‘I am dreading saying goodbye’ goodbyes, where you say goodbye in advance to prepare yourself for the big, serious final goodbyes where you know that something is changing and ending for good. You know: the scariest goodbyes of all. I had two of these big serious goodbyes this week. The first final goodbye was to my Brixton studio where I spent over two years (ending because my old studiomate got a PROPER job, damn him) so after I packed up all of my stuff and stood in the space on my own I looked around and gave it a silent goodbye before heading off to my new workspace in Peckham. The second final goodbye was, of course, Dear Data. I was at home for Sunday evening, wrapping up the weekend with a sore head (due to the pub crawl) and knew I would have no other goodbyes to track, so carefully noted down this last goodbye in my little notebook: a quiet end to a year of data-gathering. I liked drawing this last postcard, because I feel as though I have progressed since our first week when we were so nervous to put pen and pencil on paper. I feel like I’m an old hand at drawing postcards now. And maybe that’s a sign that this project should definitely come to an end: it feels second nature, instead of something new and fresh. A year is a good run, and I’m both sad and happy it’s over. 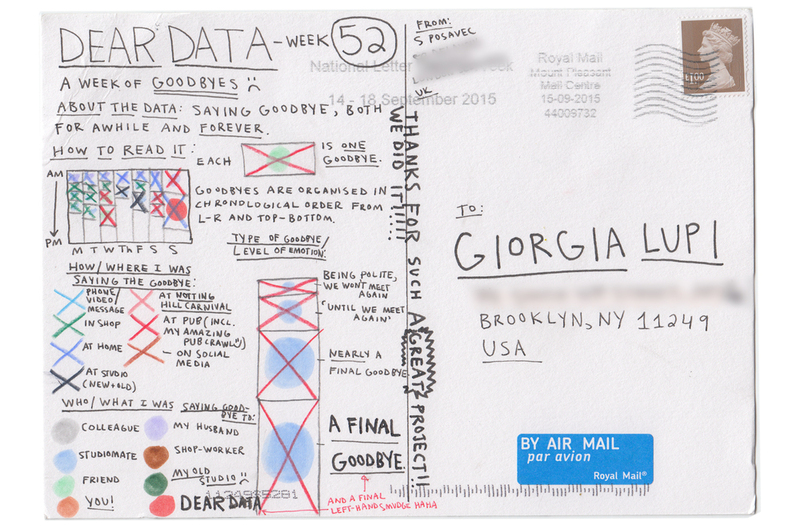 I can’t believe Giorgia forgot to say goodbye to Dear Data in her postcard! But I like how we both had other big goodbyes this week as well: Giorgia moving apartments, me moving studios. We are both starting afresh in many ways at the end of this project. Ending our weekly tracking felt so uneventful….we were finished, just like that, and then we were back to normal. It’s funny how big parts of one’s life don’t end with a bang but with a whimper. For weeks after I would go about my day always having this niggling feeling in the back of my mind that I needed to be doing something, that I needed to be tracking something, and this took at least a month and a half to shake. Reflecting upon this past year, I’m proud of what Giorgia and I have done. This project feels so big that it’s easy to forget that this was meant to just be a side project squeezed in amongst the ‘proper’ work to pay the bills. Instead, this ‘side’ project has become our biggest project of the year, which is an exciting reminder that often when you make the time for a side project it has the potential to impact the future course of your life and career. When we started this we never expected that this project would bring so many new opportunities for us and for that we are truly grateful. Thank you to everyone (and there are many, so many) whose support and kind words have helped us carry on with this project in times where we didn’t feel very sure-footed, when we were nervous, when we wondered whether what we were doing was interesting, or worthwhile, or meaningful. And a very special thank you to those of you who have been a sounding board for the progression of the project: there are so many of you, but you know who you are, and we thank you so much for your good, patient advice. Thank you to my friends and my family who have had to put up with me continually tapping on my phone at the most inopportune of times and for allowing me to include you as part of these postcards. I’ve often said this, but the things that we count and include in the postcards are inherently the parts of life that are most important to us, so I’m pleased to have a permanent postcard reminder that I am surrounded and supported by an amazing crew. And a big thank you to my husband, who has seen weekends torn asunder by his stressed-out wife drawing failed postcard after failed postcard in a nest of pens and paper at the dining room table, who has been tracked unknowingly (yet has been surprisingly cool with it), has had to hear me talk about Dear Data from dusk to dawn (and has always been very polite in how he tells me to maybe give it a rest sometimes :) ), and yet, for how much a project like this can impact our domestic routines, he has never been frustrated, but has always been supportive. I hope I’ve made him proud. And last but not least: thanks so much to Giorgia! We started this project not really knowing each other, and now we are in continual and constant contact in a way that won’t be ending any time soon as we develop and expand this project into a book. Dear Data is a transformative project that completely changed our direction for the next year, and we couldn’t have done this on our own, but only as this pair of two. Here’s to another year of lots of disagreements (and agreements too), lots of emojis, and lots and lots of drawing.